The good news first. Both of these manufacturers have fantastic sights that they offer. The bad news? They are quite expensive, and if you own more than one AR or another rifle that you’d like a red dot sight on, it’s quickly getting prohibitively expensive to own multiple of these sights. Other disadvantages are that any red dot sight is useless if you run out of battery. Optical scopes don’t need batteries and thus have a clear advantage when it comes to that. Red dots also typically don’t have any optical magnification. They come in standard 1x and therefore are harder to use on longer distances. Both Aimpoint and EOTech provide high-end red dot sight solutions. They are ridiculously sturdy and often used by military and police because they are close to indestructible. EOTech is based in the United States while Aimpoint is a Swedish company. Choosing a riflescope can take a lot of research, trial and error, and time. The biggest question many people have when deciding what type of scope to buy is: what kind of optics should I be looking for? For many close quarters shooters, the red dot holographic sight is their go-to optic. These scopes often have no magnification but feature easy target acquisition and durability. Two leading manufacturers in this type of rifle scope are Aimpoint and EOTech. EOTech is part of L3 Technologies which is active in the national security and aerospace areas amongst a variety of other industries. Aimpoint, on the other hand, was started in 1974 with the goal to increase shooting accuracy. And boy, that they did. Aimpoint was the first company to have a functional red dot sight that was usable. These quickly became the pro-forma standard for red dots in the military, law enforcement and pretty much any other shooting applications around the globe. EOTech today offers a variety of red dot scopes including magnifiers and accessories. Lately, they also have started to produce optical scopes including variable scopes for a diverse range of shooting and hunting uses. Their red dots are widely used in military and law enforcement today. The first sights by EOTech were nothing short of revolutionary. Until then all sights were round. The designed introduced was a square glass with a reticle that was unique. Today, there are quite a few EOTech clones you can find in case you want to get a sight that is more affordable. These usually have fewer capabilities than the original. Over the years Aimpoint has introduced a range of red dot sights. 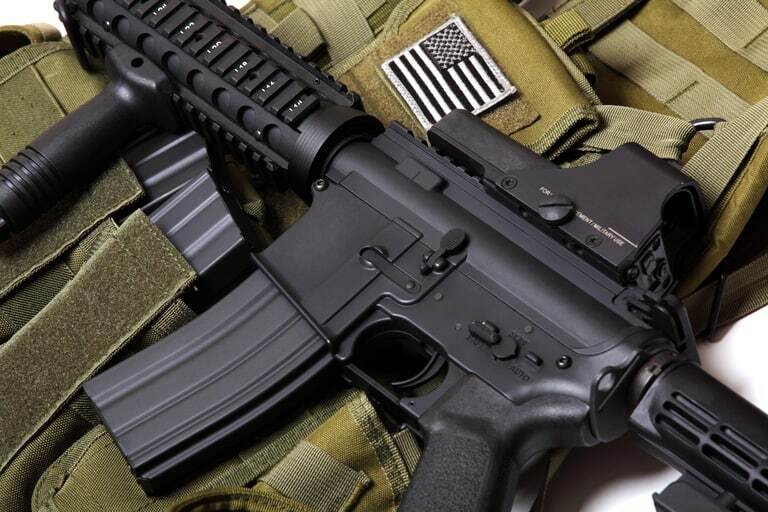 The M4 is one that is widely used in military outfits. They have also started to offer lower priced sights. These are by no means cheap but are somewhat more in reach for many shooters. Aimpoint sights are often the preferred choice for law enforcement units worldwide. They are very durable and nearly indestructible. One of their main advantages is the ridiculous high battery life which often reaches over 50,000 hours before you are required to change the battery. Similar to the EOTech sights, there are also quite some Aimtech clones available for purchase. They are cheaper and usually not as dependable, but they do the job for recreational uses. The Aimpoint Pro and EOTech 512 are moderately priced holographic red dot sights. They are comparable in many ways, but there are a few features of each scope that may sway your opinion on which scope to buy. At first glance, the stereotypical reasons for one or the other are the usual. The Aimpoint has an excellent battery life, is waterproof and easy to use. The EOTech sight, on the other hand, is more affordable, has more reticle choices, has a smaller dot for long ranges, and has the more transparent glass. So, do we have a clear winner yet? Clearly not. Let’s dig a little deeper. Both of these sights have advantages and disadvantages over the other. The most known fact about the Aimpoint is that they offer immense battery life. You can expect it to run around five years without having to change the battery. Besides that, the Aimpoint sights are pretty much indestructible which is excellent if you use it in rough environments. The outstanding feature of the EOTech is the fast target acquisition and the tremendously helpful holographic sight. They offer a fantastic view of the target with no obstructions. The EOTech uses a laser and projects a red dot onto a holographic lens. This produces a 3D view of the target giving the shooter unparalleled accuracy and visibility. Aimpoint uses a LED to produce the red dot on the reticle. The dot might be slightly less sharp, but an LED requires a lot less battery juice compared to a laser. This is where the difference in battery life comes from between both of these sights. Those without a lot of time on your hands, here is a quick rundown of comparable features on both the Aimpoint Pro and the EOTech 512. ​Size ​5 1/8” x 2 3/16” x 2 5/8” 11.6 oz. including covers, mount and spacer 5.6”x 2”x 2.5” 11.1 oz. As you can see, there are clear differences between the two holographic sights. Let’s take a closer look at the features that each sight provides the shooter. The displays on both the Aimpoint Pro and EOTech512 sights are generous with their eye relief and parallax settings. The Aimpoint Pro features no parallax settings. The eye relief is unlimited. This sight is designed for use in rapid fire scenarios. 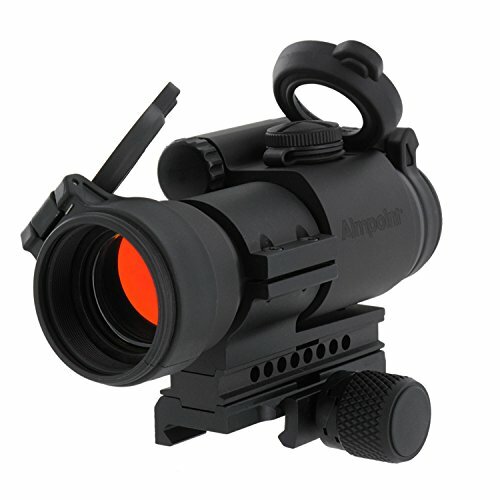 The display on the Aimpoint Pro is designed for use with both eyes open. This feature enables the operator to have greater situational awareness than with sights that require single eye operation. Both eyes open also allow for higher speed when acquiring the target. One of the best features of the display on the Aimpoint Pro sight is the ability for the sight to activate even with the lens caps on. The lens caps on the sight are clear enabling the rifleman to sight a target, in an emergency situation, without having to worry about the lens covers. The lenses on the sight are still protected, but your targeting isn’t compromised. 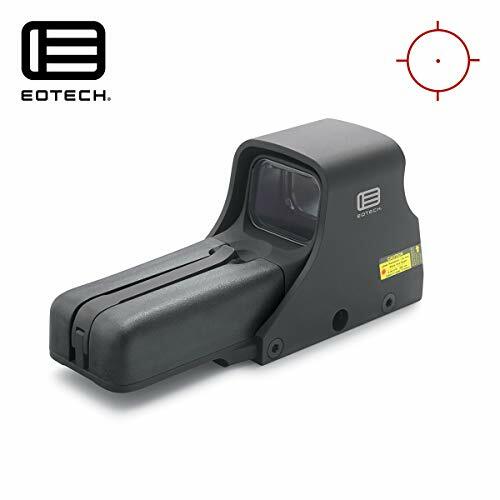 The EOTech 512 display utilizes an accurate heads-up display (HUD) that allows the user greater situational awareness. The sight can be used on multiple weapons and is not limited to carbines. Many people opt to mount the EOTech on their crossbow, bolt guns, and small caliber machine guns. 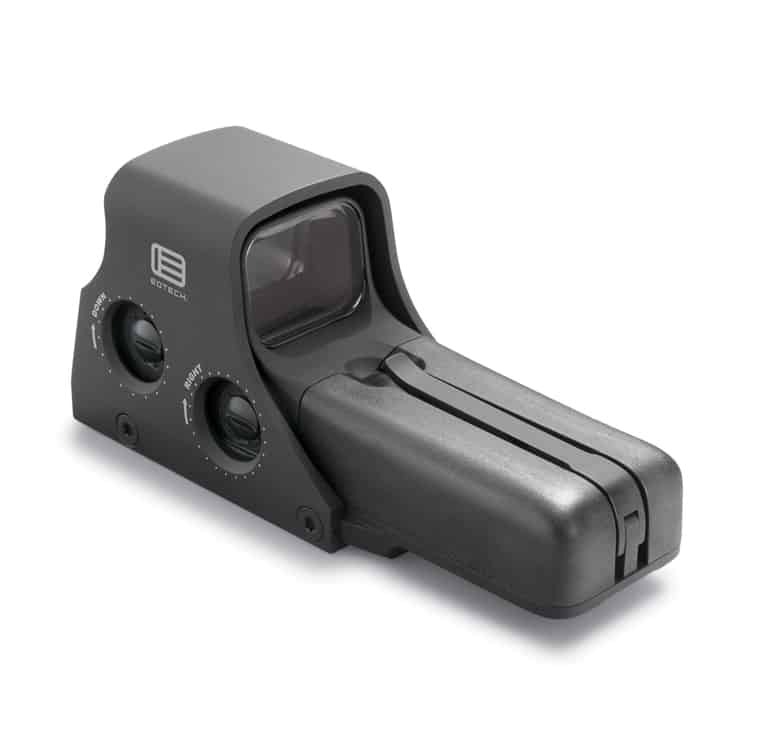 The HUD on the EOTech 512 uses a laser to illuminate the red dot pattern embedded on the sight. This allows you to sight your target accurately, no matter the positioning of your eye in relation to the display. If you need highly adaptive sighting, the EOTech gives just that when shooting. The Aimpoint Pro sight features a 2 MOA dot. Some models of the Aimpoint pro have an adjustable 2-4 MOA dot. There is a 1 MOA dot on the EOTech 512. The MOA ring goes from 0 to 68 and offers plenty of correction for the operator. The Aimpoint Pro sight can be a little funky when interacting with various background colors. This may be a preference. There are adjustments for the brightness of the sight. Once you adjust for your preferred brightness on the red dot, you should find that it corrects the transparency issues. The EOTech is much smoother when sighting because it doesn’t react the same way that the Aimpoint scope does to the background color. This may have something to do with the overall construction style of the two scopes. Best Scope: It’s a wash and depends on how you prefer your aim dot to look. Since they are the same magnification and size, it is about personal illumination preference. The Aimpoint Pro is night vision device compatible. The lenses are coated to ensure that the reticle is visible. The EOTech512 is compatible with night vision. EOTech recommends that you switch the scope to night vision mode before you turn the scope. Doing so avoid image saturation when using the scope in tandem with an NVD. 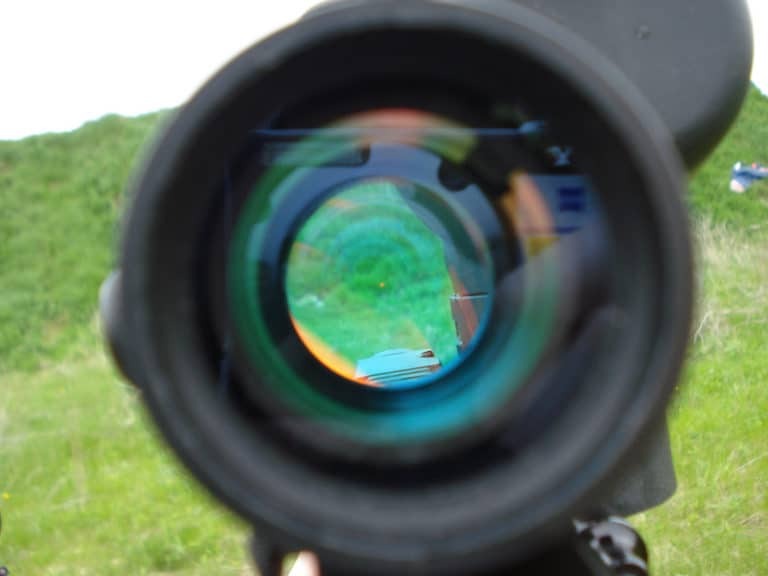 Best Scope: When it comes to night vision both scopes perform well. The overall sizes of the two scopes are the same. Their weights are almost identical. The housing for the display is where the two scopes differentiate. 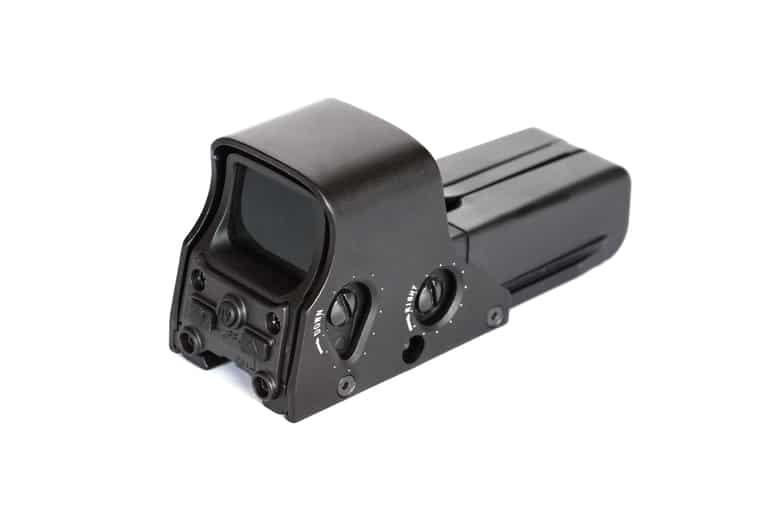 The EOTech sight housing is a thin box that almost disappears when sighting your target. It is easy to ignore the little metal box when you are looking towards your target. On the other hand, the display housing on the Aimpoint Pro is a little bulky. If you like a slim profile for your sight, the Aimpoint pro may not have what you want. Best Scope: User preference is going to play a big part in this. The slim profile of the EOTech 512’s display housing makes it better for overall function. The usability of the scopes in various environmental conditions is vastly different. The Aimpoint Pro scope makes sure that you know that this scope is going to function, no matter what you put it through. The EOTech 512 lags considerably behind the Aimpoint Pro when considering operating conditions. ​Waterproofing ​150 ft. ​150 ft.
​Shock ​Operable before and aftershock. Limits: X-axis: 500 g, 0.7 – 1.1 ms (3 shocks), Y-axis: 40g ±4g, 11 ±1ms (2 shocks in each direction, Z-axis: 40g ±4g, 11 ±1ms, two shocks in each direction. Functional during exposure (room temperature) ​Not listed. The only mention is the shock capability of the batteries installed within the scope. ** EOTech reached a $40 million settlement (2007) on the 512. This was because of zero shift that occurs with the sight when zeroed at ambient temperatures (79* F) and then used in a colder or hotter environment. These numbers are only the operating temperature that the sight will function in, not the actual operating temperatures of a zeroed weapon. Some EOTech 512 optics that reached a zero shift could never operate with an accurate zero again. The difference in the environmental specs given by the two manufacturers shows what each one values with performance. The Aimpoint Pro is specifically designed to take a beating. They use the smaller 3v battery to withstand shocks and vibration and not allow the sight to be interrupted. The waterproofing on the Aimpoint Pro means that you could practically scuba dive with the scope on and it would still be functional. The 150-ft. depth of the Aimpoint completely dwarfs the EOTech’s 10 ft. submersion depth. For any amphibious firing conditions, the Aimpoint Pro is a superior choice. 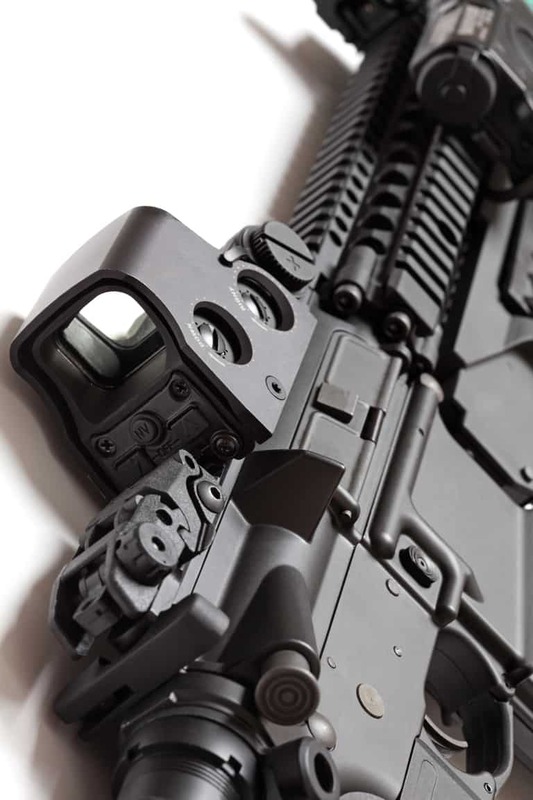 The basic clear covers on the Aimpoint Pro are designed not only to protect the glass but to assist the operator when firing in intense conditions. They protect from water, sand, and a vast majority of chemicals likely to be found in a combat zone (lubricating oil, diesel fuel, hydraulic oil). The EOTech 512 doesn’t have any chemical resistance listed on its user manual. Because of the housing of the display, it appears that chemical interactions would disrupt the HUD. Finally, we come to temperature operating parameters of the two scopes. It is important to note that the settlement against EOTech for faulty scope operation in harsh weather conditions was in 2007. There doesn’t seem to be a significant reporting of additional issues since then. Unfortunately, this doesn’t alleviate the functionality issues that come with the use of the AA batteries within the scope EOTech has chosen to put inside their 512. The battery choice for the two scopes is the main difference in their temperature functionality in real-world conditions. AA alkaline batteries have a working temperature of -30° C to 55 C (slightly higher for lithium). The 3v batteries that are the power source for the Aimpoint Pro Scopes have an operating temperature of -40°C to 125°C. While it is never likely that you will be operating in conditions of 125* C (because you would be dead), your scope may experience temperatures much higher than the physical environment. The barrel friction from rapid-fire heats your weapon, the heat transfers to the scope that is mounted on the gun. This means that the temperature of the scope can rapidly change if firing in a cold environment. Also, in a hot climate shooting scenario, the temperature of the scope will go much higher than the ambient temperature. The temperature range for the battery in use doesn’t seem like it should be a huge deal until you break down the usage. In this case, the use of an AA battery instead of a 3v stunts the performance of the EOTech 512. Best Scope: Hands down the Aimpoint Pro. In addition to the operating temperature issue with the two battery choices, there is the question of battery life. There are striking differences between the EOTech 512 and the Aimpoint Pro. The EOTech 512 has the battery life of 1000 hours. There is an automatic shut off on the EOTech of 8 hours. In real-world situations, the automatic shut off can create problems (imagine being in the middle of a combat situation and your sight powers down). Many people insist on having a good iron sight on their weapon, and with the EOTech 512, it is a must for a worst-case scenario. In contrast to the EOTech 512, the battery life of the Aimpoint Pro is 30,000 hours. That is 3.5 years of always-on activity for the scope. There is no auto shut off and many users of the scope remember to change the battery on their birthday every other year or so. If you turn the scope off, the battery life increases dramatically. Longest Life: Aimpoint Pro has a superior battery and lifespan of always-on usage. If you go line-by-line on features and specs, the EOTech 512 is a great scope for those who are not faced with life and death situations. The Aimpoint Pro is a superior scope when in a combat situation. Those who need a scope that they can count on to save their friends will choose an Aimpoint Pro. That being said, the EOTech 512 is a great scope. It is just designed to function differently than the Aimpoint. Many people will never see a combat situation and will enjoy the freedom of the display on the EOTech 512. The slimmer profile and smooth operation make the 512 an excellent choice for many marksmen.